I've always enjoyed growing flowers. When I was young I would enjoy helping my granny with her gardening. Then, when I was ten and we moved into a bigger house, I was given a small patch where I could grow my favourite flowers. Nowadays, when time and weather permit I am often to be found looking after my flowers and vegetables. There's nothing better, after a heavy day at the office, than going round the flower beds, doing a bit of weeding or dead-heading or whatever other job needs doing at the time. It really does reconnect me with nature and the Earth far better than any kind of sight-seeing. The photo above/left shows one of the first pansies I grew when I got back into gardening here in Horsham. 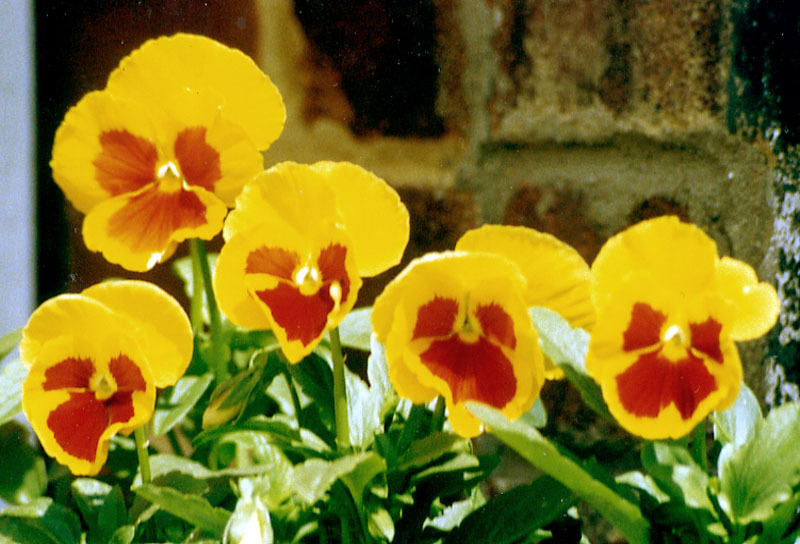 It is a "pedigree" variety (F1 hybrid) called 'Imperial Gold Princess' - the pure scarlet blotches are rare for any strain of pansy, and set against the bright yellow backgrounds it really brightens and cheers up a place. 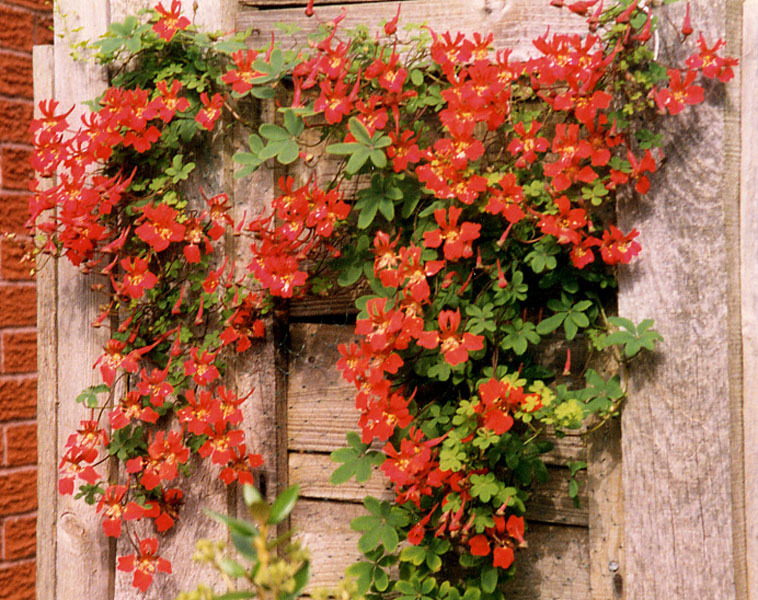 Another treasure is the Flame Creeper (Tropaeolum speciosum) I have grown here in Horsham (right). These are not easy to keep alive, but I seem to have found a good spot here in my front garden. My favourite flowers, though, are Primulas, especially the so-called candelabra species, in which circular whorls of flowers appear at regular intervals on an upright stem. My favourite Primulas page has some photos of those closest to my heart. The National Auricula and Primula Society is devoted to the growing of Primulas in the UK. The society is divided into regional sections, their main website being run by the Midlands & West section. There are separate sites for the Southern and Northern sections. 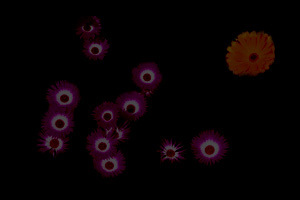 I've also included pages with more flower photos, taken in my own gardens in 2009 and 2013. There is also nothing tastier than one's own home-grown vegetables. Though I only have a small vegetable patch, I usually grow two or three rows of 'Foremost' potatoes - these have a gorgeous flavour and beat the pants off anything you can buy in the shops. I love freshly-grown runner beans - picked of course before they get tough and stringy like shop-bought ones. 'Sugar Snap' peas are also a delight. This variety grows about six feet (2m) tall and you can just pick the pods as they have just filled out and eat them whole - the pods don't have the tough inner linings that conventional peas do - and, mmmmm, they are so sweet! I also like to grow a bit of white sprouting broccoli. Again, the home-grown taste is delicate, and they mature in the early spring when green vegetables are somewhat few and far-between. Unquestionably the best gardening socity - and website - in Britain is the Royal Horticultural society. They keep a number of great gardens across the country, including the fabulous grounds of their HQ at Wisley in Surrey (near M25 J10). Enjoy the photos I took at Wisley on 22/4/2003. They run a number of annual flower shows, including Chelsea and two each year in Malvern. The RHS also has a great website with lots of gardening information, including an online version of the Plant Finder directory, which you can query to find lists of nurseries that sell specific varieties of any cultivated plant. Paul Christian Rare Plants, who specialise in unusual bulbs. One favourite I have obtained from here is Tropaeolum tuberosum 'Ken Aslet' - this is a Nastirtium-family climber that grows from conical yellow corms with lovely leaves and orange-yellow flowers from mid to late summer. Jacques Amand offers an excellent range of bulbs and other flowers.